"Sunflowers Personal Checks" product is already in your cart. Golden Sunflower Personal Checks will provide sunshine every day whether it is raining, snowing or cloudy. These perky yellow posies make a lovely backdrop for writing checks and create a stimulating energy of positive thinking! With a variety of four different poses the beauty of these golden flowers emerges as a strong and beautiful flower showing off its many faces but always making you feel better. 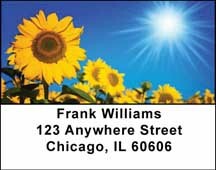 Whether there is a single flower or a whole field of blossoms, these Golden Sunflower Personal Checks will show you what a sunny day is all about and will definitely put a smile on your face!